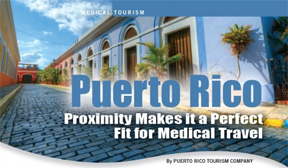 One thing that is beginning to flourish in Puerto Rico during this island’s difficult economic time is medical tourism. Because Puerto Rico does not have to pay a lot of taxes that U.S. states have to, it is possible to get cheaper medical services with the same medical quality that anyone can find in the United States. Puerto Rican doctors go through the same years of training as do all American doctors, and they must by law follow the same guidelines as American doctors. What makes Puerto Rico attractive is that the medical costs are 60 percent less than in all the U.S. states. Just as equally appealing is the wait time for medical transplants. In the United States, waiting time for organ transplants (also depending on the organs) is on average 8.1 months. in Puerto Rico, the wait time for organ transplants is 1.5 months. This is a considerable time difference, and for someone in a life and death situation, this can be a major factor. Another thing is that the Commonwealth government in Puerto Rico is beginning to invest more money into medical tourism. By 2017, the Commonwealth government will allocate $300 million for up-grading medical facilities on the island for helping those patients not only in the United States but from around the world who need life-saving medical procedures and medical care. From my own experience, despite all of its shortcomings, the American medical system is one of the best in the world. I remember when I visited an eye clinic, I saw people from as far away as Italy and Brazil go to this clinic because they or their family members needed eye surgery to correct their failing vision. Many went to this eye clinic in Sycamore, Illinois, because it had a very short waiting time, and because its one of the best in Illinois. For many patients from Europe and other parts of the Americas, this is a difference between seeing perfectly again or going blind. Many in Europe and on other continents have long waiting times, and this may mean a worsening medical condition or even death. If Puerto Rico can provide quality medical care at a much lower price, then it may indeed join those countries which provide medical care for those who desperately need it.